SiO coatings on aluminum substrates were prepared using hard-facing performed at ambient conditions. Well-integrated SiO/aluminum interfaces are created via electrodiffusion that takes place during processing. Analysis of surfaces with scanning electron microscopy/EDS and nanoindentation confirm atomic stoichiometries and hardness values consistent with SiO. Hard-facing performed at ambient conditions is a way to coat aluminum with SiO that otherwise would decompose at elevated temperatures typically created using conventional hard-facing. Transition-metal doping for titanium dioxide (TiO2) is attracting attention for the study of visible-light responsive photocatalyst. Its photocatalytic properties were investigated via various spectroscopic approaches, though surface studies had not yet progressed owing to the difficulty in obtaining its well-defined surface. In this report, we propose that a well-defined crystalline TiO2(110) surface may be obtained by the codoping of chromium (Cr) and antimony (Sb) with commercially available wafers. 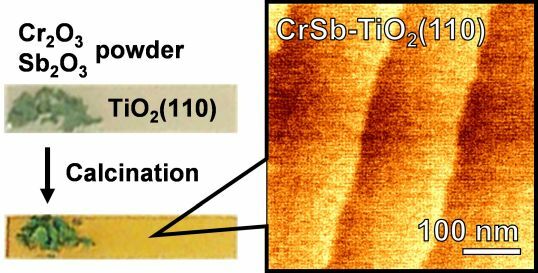 Cr and Sb are codoped by a solid-state reaction of TiO2(110) wafer and dopant powder. The prepared wafer exhibited visible-light responsivity on absorption below wavelengths of 600 nm. The surface morphology characterization, performed by atomic force microscopy (AFM) revealed that the Cr and Sb codoped TiO2(110) surface has a well crystallized step-terrace structure that is atomically flat, while monodoped TiO2(110) surface does not. The codoping of Cr and Sb with TiO2(110) wafer should contributes towards retaining the stable rutile-TiO2 lattice structure and produces a well-defined TiO2(110) surface structure with visible-light responsive characteristics. 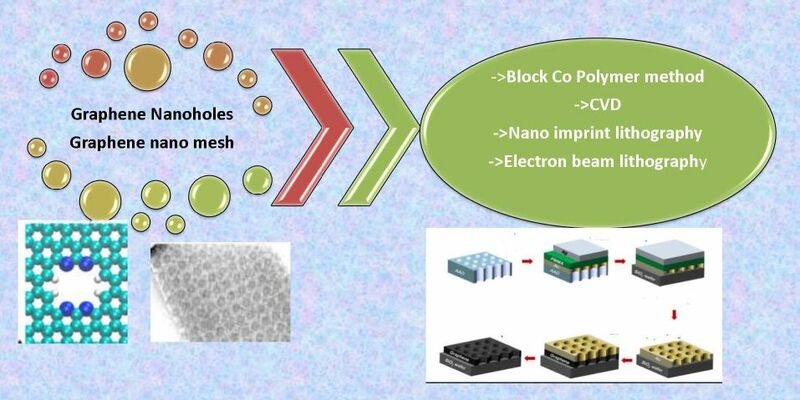 In this work, various ternary cerium oxide/lanthanum oxide/cobalt oxide (Ce/La/Co) nanocatalysts were synthesized by co-precipitation method based on response surface methodology (RSM). The optimum predicted surface area was found to be 67.6 m2 g−1 at calcination temperature of 650°C, La content of 10.0 wt%, and Co content of 8.0 wt%. Average crystal size of optimum ternary Ce/La/Co catalyst was estimated 11.4 nm. The confirmation tests revealed that experimental data can be predicted well by the model. Furthermore, the prepared catalysts were evaluated by Brunauer-Emmett-Teller (BET), Barrett-Joyner-Halenda (BJH), X-ray diffraction (XRD), field-emission scanning electron microscopy (FESEM), energy-dispersive X-ray (EDX) and NH3 temperature programmed desorption (NH3-TPD) analyses. The characterization results confirmed that ternary Ce/La/Co catalysts were successfully synthesized. 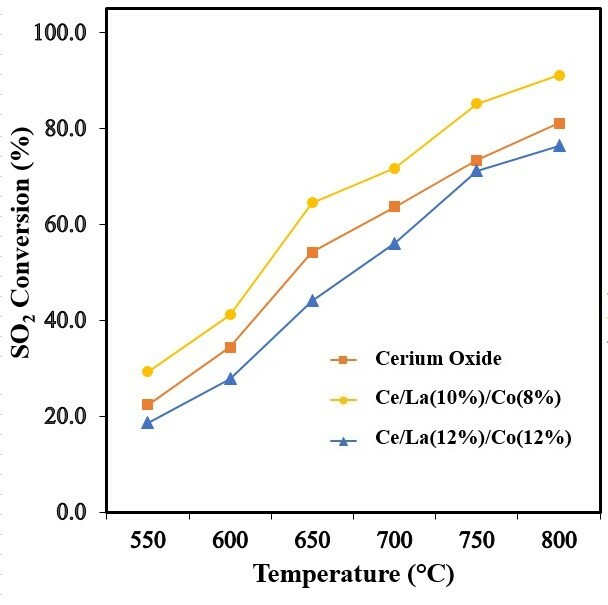 Also, the NH3-TPD result showed that total active sites of optimum ternary Ce/La(10)/Co(8) catalyst with La content of 10.0 wt% and Co content of 8.0 wt% was greater than that of single cerium oxide catalyst. The optimum synthesized catalyst was tested for SO2 reaction by methane to sulfur. SO2 conversion and selectivity of catalysts at various temperatures were determined. The better performance of Ce/La/Co optimum catalyst at different temperatures was obtained for SO2 reduction. Also the selectivity of the optimum catalyst for production of sulfur is better than other catalysts. 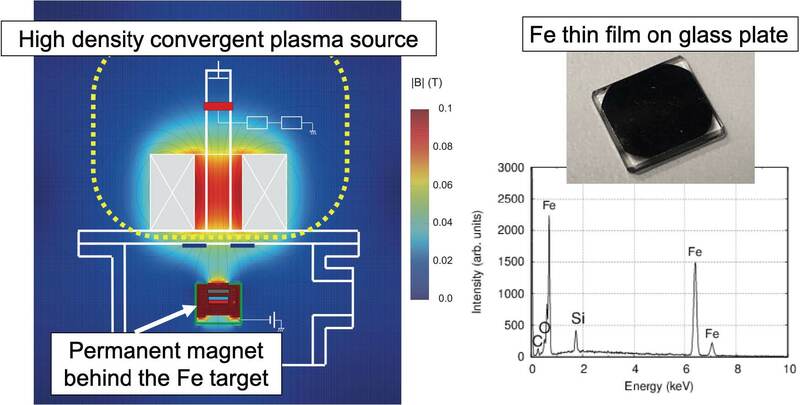 A high-density convergent plasma sputtering device has been developed for magnetic film deposition. The external convergent magnetic field is produced by a solenoid coil and a permanent magnet positioned behind the ferromagnetic metal target. The ion density and the ion accelerating voltage are individually controlled since the ion production and sputtering areas are separated like an ion beam sputtering device. Iron (Fe) thin films are deposited on an unheated substrate using argon plasmas under the target to substrate distance of 54 mm. The films consist of the α-Fe phase with a body-centered cubic crystal structure. The deposition rate was about 25 nm min−1 at a sputtering gas pressure of 0.2 Pa.
Graphene, an ultra-thin derivative of carbon, has hindered a lot of applications because of its unique characteristics. It was found that superb improvements on properties can be made on further by creating nanopores or nanoholes on the surface of the graphene film. Such holed graphene can be used in energy storage, fuel cells, biosensors, biochemical applications, plasmonic tweezers, etc. This is because pores can contribute toward more surface area and eventually toward transportation and storage for electron/ion, gas, and liquid. This paper is a review of graphene nanohole fabrication methods.